I wanted to mix another Sleepy Bear but I did not have any blackberries. Raspberries were an acceptable substitute, but when I tasted the raspberry honey blend, I found myself craving tequila instead of rum. There was something in the blackberry that wanted to blend with the smokey vegetal flavors of reposado tequila, so I followed my instinct. The oaky, sugar cane flavor of my go-to aged rum is much fuller than the flavor of my go-to reposado, and to fill in the gap, I thought a dash of allspice dram would be perfect. It was. Muddle the raspberries in the honey syrup until you have a fresh raw jam. Shake all ingredients over ice and double-strain into a wine glass. 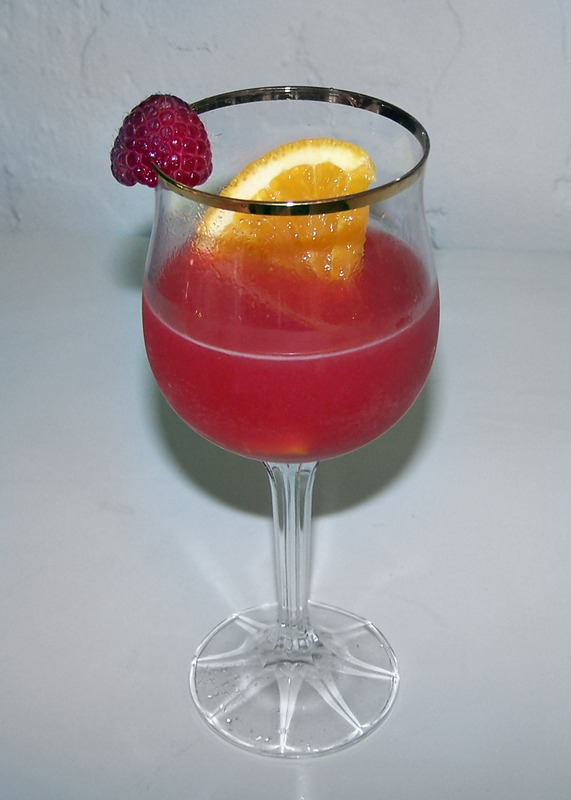 Cut a large, thin orange slice and place it in the glass, and cut a raspberry so it sits on the rim. The orange slice is really just for looks, though it add some orange oil to the aroma. All the flavors of the different ingredients were perceptible, which is the mark of a successful mix, although I admit this isn’t the manliest concoction I’ve poured lately. Even with two ounces of tequila, there is no escaping that scintillant pink color. If you want to drink raspberries, it’s the price you must pay. Categories: original creations | Tags: allspice, allspice dram, booze, cocktail, cocktails, drinking, drinks, honey, honey mix, honey syrup, lime, lime juice, mixed drinks, mixology, muddle, orange slice, pimento dram, raspberries, raspberry, reposado, seasonal drinks, summer drinks, tequila | Permalink. Nice recipe. Allspice dram does really well with red fruit (go figure). The color is fine…embrace the the pink…often it means fresh fruit is in the drink.